Coniston Power Boat Records Week is the only event in the Powerboat Racing Calendar to bring together all classes of boat. Entry is open to all from tiny hydroplanes, through inshore circuit racers to the largest offshore boats. It is the finale to the racing season. Competitors and officials from all over the country assemble annually for what has been a popular event since it's inception in 1970. For almost a hundred years Powerboat record attempts have been made on several of the English lakes including Ullswater, Windermere and Coniston Water. The most famous drivers have been Sir Henry Segrave, Sir Malcolm Campbell and Donald Campbell. 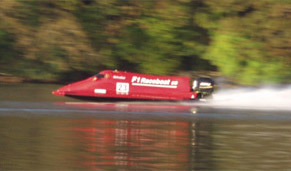 Norman Buckley, was instrumental in the inauguration of Records Week and together with The Windermere Motor Boat Racing Club, had various courses on Windermere surveyed. In the mid 1990's One, Two and Three Hour Records were attempted during the annual Enduro, which took place at the end of Records Week. Following the introduction of the Winderemere speed limit in early 2005, and after a good deal of effort from many volunteers, Records Week 2005 took place on Coniston Water over a newly surveyed kilometre course. Coniston, the "spiritual" home of Record breaking, since the Campbells, is most welcoming to Records Week. Drivers, support crews, officials, families and spectators are most welcome to enjoy the beautiful Coniston area, surrounded by its spectacular mountain scenery.